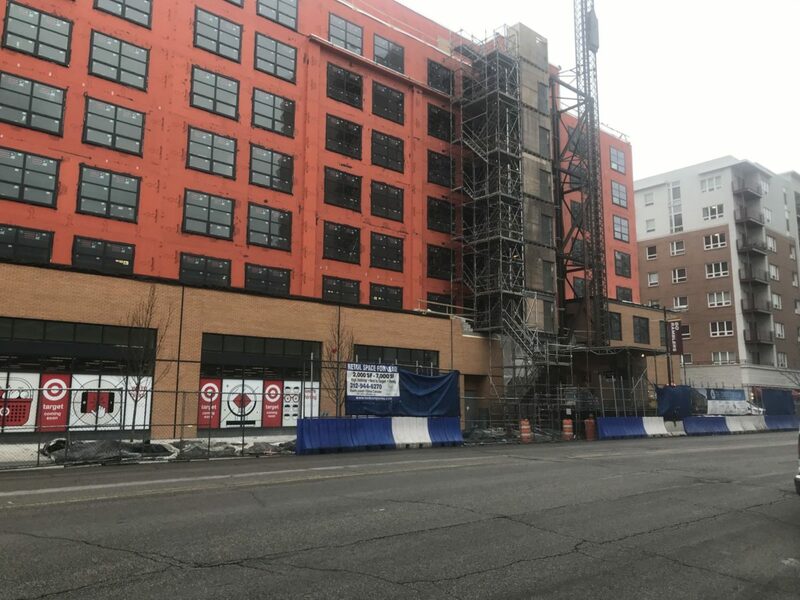 Kayleigh Padar | The PHOENIX TargetBoth developments — which are both set to open this spring — will have retailers on the first floor and apartments on the upper levels. While most students were away from campus during winter break, construction crews continued working on a sports practice facility on campus and two new developments near Loyola’s Lake Shore Campus — The Arcade and The Concord at Sheridan, both of which are scheduled to be completed this spring. The Arcade, located on the corner of Broadway and West Sheridan Road, will have stores on the first floor and apartments on the upper levels, according to Ally Brisbin, staff assistant to 48th Ward Alderman Harry Osterman. Bank of America was part of the previous building, and is the only confirmed tenant so far, Brisbin said. The new development is replacing the Woodruff Arcade Building which had been there since 1923 and was demolished last March after it didn’t receive landmark status, The Phoenix previously reported. When the building was sold, local businesses — such as The Coffee Shop and The Mustard Seed, a Christian bookstore — were given a year to leave and forced to relocate, according to The Phoenix. In recent weeks, workers have been putting up the walls on the second and third floors at The Arcade, Brisbin said. Early next month, construction on the utilities for the building is set to begin, but Brisbin said it’s unclear exactly how the utility work will affect traffic. The construction company hasn’t sent over the plan yet. Madison Construction didn’t respond to requests for comment. Less than a block north of The Arcade, The Concord at Sheridan will house a smaller version of Target and another undetermined retailer, along with apartments, The Phoenix reported. 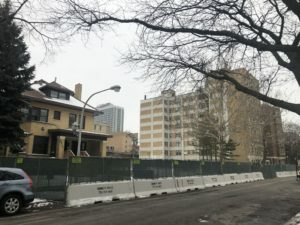 At The Concord, 60 percent of the apartment units will be rent controlled, meaning landlords will be limited in how much they can charge for rent, according to Mike Land, staff assistant to 49th Ward Alderman Joe Moore. The development is “transit-oriented” because the building has less parking and is close to public transportation, Land said. The Concord at Sheridan was originally expected to be finished in fall 2018, then in March of this year, The Phoenix reported. Construction is now expected to end later in the spring, according to Land. Late delivery shipments and delays due to wind contributed to the later completion date, Land said. 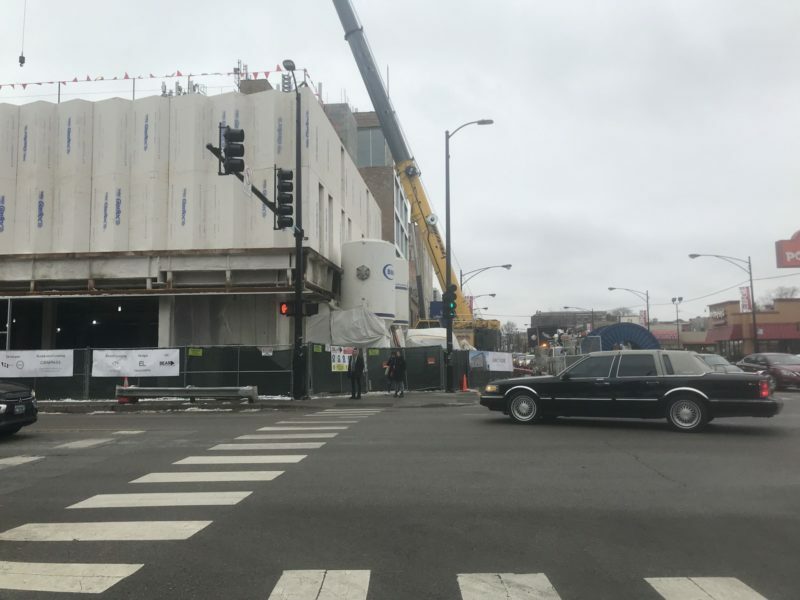 Residents can expect traffic delays and southbound lane reductions on North Sheridan Road, specifically when workers pour new concrete on the elevator that’s on the outside of the building, according to Land. In addition, the flow of traffic will change and the lanes will be shifted in order to establish the entrance to the parking garage in March, Land said. Construction is in its final stages, so workers will soon be moving inside to complete the interior of the building, according to Land. Edgemark Commercial Real Estate Services LLC didn’t respond to requests for comment. On campus, crews are continuing construction on the Alfie Norville Practice Facility, near Mertz Hall. Loyola’s basketball and volleyball teams are scheduled to practice in the new building after its expected completion in August 2019, The Phoenix reported. Allan Norville, a Loyola alumnus who played basketball from 1956-59 and graduated in 1960, donated most of the $18.5 million needed for the project, The Phoenix reported. Shannon Kennedy, a sophomore studying anthropology and criminal justice, said she’s excited about the new Target because it’ll be safer and more convenient for her to go to compared to traveling to another location. “Having a Target that’s right around campus with Campus Safety across the street definitely feels better for me personally, especially at night,” Kennedy, 19, said. Kennedy said she appreciates the makeshift sidewalk near the construction of The Concord at Sheridan and hasn’t been inconvenienced by the construction. Avery Ries, a first-year with an undeclared major, said in general construction on and off campus doesn’t bother him because he adjusts his route.